So everyone who follows me on facebook knows of my obsession with Downton Abbey. I know it is totally trendy but what can I say, I love it! Its actually been a great release for me with recent stresses. What better escape is there than to an Edwardian estate? For you 3 people who don’t watch it, it is a BBC television series set in a British manor house called Downton Abbey from 1912 onward (the first episode starts with the sinking of the titanic). According to the website there are 33 developed characters within the series because we get to know the Lord and Ladies upstairs and the hard working servants downstairs. What is so refreshing about this show is that wealth and status does not define goodness with the various character profiles. There are the villainous and noble of both classes. In fact, it is amazing how well rounded every character is. In these economic times I find it is an easy out to make the rich guy the villain. For instance, in the much touted Social Network Mark Zuckerburg is immediately under suspicion because he is rich. It is also historically accurate including such nuances as having Lady Grantham be an American heiress, which at the time was very common. With land prices reducing in value pre wwI British nobility relied on American women to save their fortunes and estates. There is also a great sense of waiting in the gentry vs work and business in the servants quarters.All the details in sets and costumes are superb. So, two seasons have come and gone (stupid BBC and their short seasons! Now we have to wait a year. What’s a girl to do!). 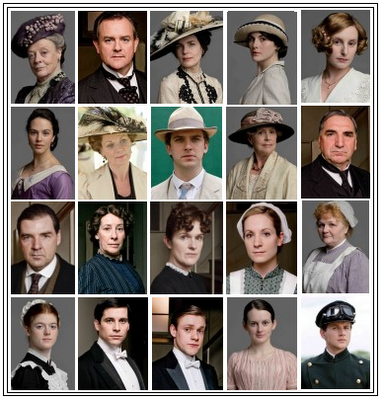 To read an update on the various characters go to http://enchantedserenityperiodfilms.blogspot.com/2010/09/meet-characters-of-downton-abbey.html. They are all wonderfully acted especially the Dowager Countess played by the amazing Maggie Smith. I think what makes the series work so well is the tension and humor on so many levels. The house in many ways is a kind of min-world experiencing all the problems and victories of class struggle, relationship drama, sibling rivalry, health issues, forbidden love, spite etc. You also have the fascinating role the outside world plays on the mini-world of Downton. With the waning importance of the upper class and the greater options to working class families for education and employment reliance on the Grand House was not the same as it once was. With the advent of World War 1 (Did you know that 30,000 people died in one battle of that war. Wow!) and the death of so many young men ‘service’ as a profession was even diminished further. Also, the war brought the mixing of classes with servant and Lord battling together for the same cause. In fact, in one scene in Downton the servant William saves Matthew Crawley in the worst battle of the war. Still performing his duty to the end. You have characters like Carson, the buttler, who resists change almost as much as Lord Grantham and others like Lady Sybil who yearns for it. Then you have other great stories like Anna and Bates the servants romance that ends on quite the cliffhanger for season 2. The Dowager is my favorite character. She is actually quite modern and has all the great lines in the show. Here are some good one’s. I was talking with my friend the other day about the chaos in Syria. We both agreed sometimes it feels like there are too many challenges and sadness in the world. It can feel like there is nothing you can do to help in the world. Its kind of comforting to escape to a world that feels in control. Downton Abbey also satisfies all emotions. It is romantic, sad, funny and everything else. The only bad thing about it is I have to wait a year to see it again. Thank goodness I have season 2 on amazon video on demand (season 1 is available via netflix season 1). It has been such a gift to me this month. Seriously I needed an escape to Edwardian England. Thank you BBC and Julian Fellows and all the actors and everybody involved. I can’t recommend it highly enough. Also, it has been hilarious to watch Downton while reading the tweets of the comic Patton Oswalt @pattonoswalt . They were so funny and more so because he’s a die hard fan. I have found that television is much more enjoyable if you can follow a twitter handle while you watch (I love watching the debates while looking at twitter). Even the music in Downton is great! Enjoy and now we just have to look forward to Great Expectations coming soon! Pingback: Character Profile 2: Isobel Crawley | Reviewing All 54 Disney Animated Films And More!